Is Drinking Cold Water During or After Exercise Good or Bad? Drinking water is the best way to replenish fluids during and after exercise, but you may find different advice about whether to drink cold water, ice water, or tepid water. 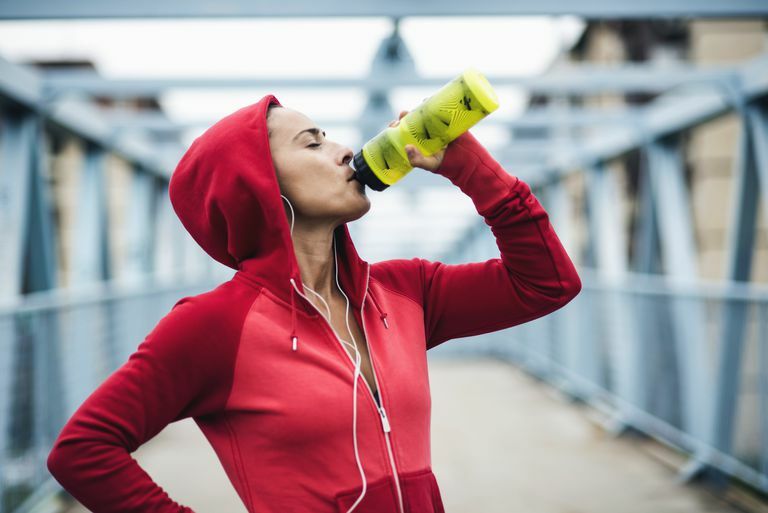 Exercise authorities such as the American College of Sports Medicine and the International Society of Sports Nutrition recommend that water and other drinks be chilled when used during exercise. There are several reasons for this recommendation. As well, if you are working in a hot environment, chilled water is recommended rather than room temperature water. You raise your body's core temperature when you exercise and you lose fluids through sweat. Drinking cold water or chilled sports drinks helps delay or reduce this rise in temperature. Especially in hot environments, drinking ice water or an ice slurry can help keep core temperature from rising. This has been shown to help performance both for strength training and endurance exercise. A large reason for the recommendation to have cold drinks available during exercise or athletic competition is that most people find that they taste better. They are likely to drink more and to drink more often, helping prevent dehydration. Even a minor amount of dehydration can impair athletic performance. Cold drinks are warmed to body temperature within five minutes of drinking them. This does not delay the fluid passing from your stomach to your intestines to be absorbed. The water then replaces that lost in sweat during exercise, preventing dehydration. You may see claims that cold water halts digestion, but several older research studies found no difference in liquid meal temperatures on gastric function. Your body expends a little more energy to warm up ice cold water to body temperature. The effect is minor, with estimates ranging from 5 to 18 calories for a 16-ounce glass of ice water. If you repeat this throughout the day for five or more glasses, you may burn as many calories as walking a mile. Keep in mind this is no substitute for actually exercising. One urban legend circulating by email and social media claimed that drinking cold water after a meal could cause cancer. This is completely unsupported by research. A rationale was that it solidified cancer-promoting substances in fats in your stomach, exposing you to them for longer. As the water in your stomach warms to body temperature within five minutes, there is no support for this belief even in theory. Cold: Drinks for exercise should be cooler than room temperature. Flavored: Drinks should be flavored to make them taste more appealing, helping people to drink more. A squeeze of lemon juice or a pinch of a flavoring can help without adding calories. Handy: Drinks should be served in containers that let you drink without disrupting your exercise. Sports bottles have a sipper valve on top allow you to drink without removing the cap. Hydration packs have a sipper tube. Bottles with a wide neck allow you to add ice to your water or sports drink to keep it cooler throughout your walk or exercise session. Some bottles are squeezable, while others have a straw to allow you to drink without squeezing. It is better to carry a water bottle with you in a water bottle-holding pack when walking rather than relying on water fountains along the way. Sports Drinks: Use a sports drink to replace carbohydrate and electrolytes when exercising for longer than one hour. You lose electrolytes (body salt) by sweating. Without replacing it, you risk hyponatremia if you continue to replenish with plain water and no salt. Plain Water: If exercising less than an hour, plain water is just fine, maybe with a squeeze of lemon juice or other flavorings if preferred for taste. Drink to Thirst: The old advice, still given by some coaches, was to drink, drink, drink and that thirst couldn't be trusted to tell you when you needed to drink. However, slower runners and walkers were taking that too much to heart and ending up with hyponatremia. That is a serious condition. Updated guidelines caution endurance runners and walkers that over-drinking can cause hyponatremia, so most exercisers should use thirst as their guide rather than forcing fluids. Brearley MB. Should Workers Avoid Consumption of Chilled Fluids in a Hot and Humid Climate? Safety and Health at Work. 2017;8(4):327-328. doi:10.1016/j.shaw.2017.07.001. Kerksick CM, Wilborn CD, Roberts MD, et al. ISSN Exercise & Sports Nutrition Review Update: Research & Recommendations. Journal of the International Society of Sports Nutrition. 2018;15:38. doi:10.1186/s12970-018-0242-y. Rodriguez N, Dimarco N, Langley S. American College of Sports Medicine Position Stand. Nutrition and Athletic Performance. Med Sci Sports Exerc 2009 41 709 731 10.1249/MSS.0b013e31890eb86. Tan PM, Lee JK. The Role of Fluid Temperature and Form on Endurance Performance in the Heat. Scand J Med Sci Sports. 2015 Jun;25 Suppl 1:39-51. doi: 10.1111/sms.12366.